Pattern Number Contact me to get a list of the patterns. Contact me at oth98@hotmail for ordering. 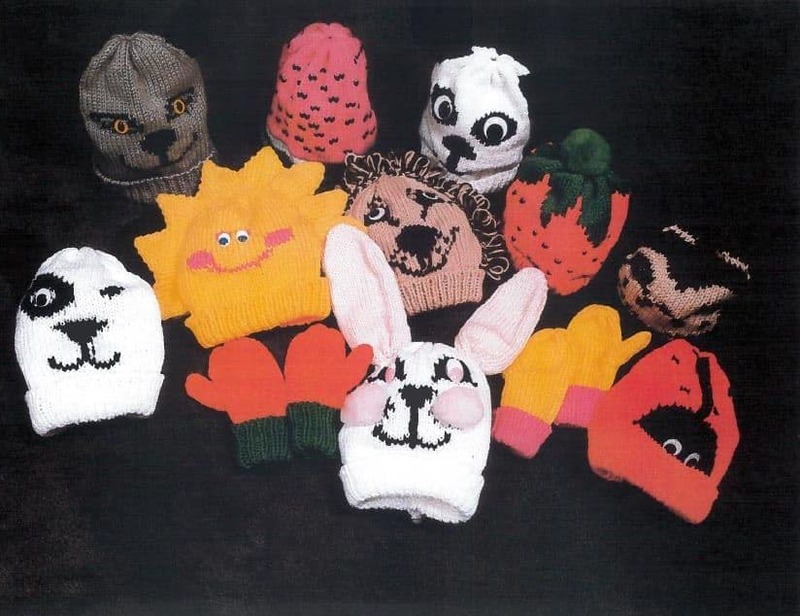 Kids Crazy Hats for Knitting! GREAT PATTERNS FOR CRAFT SHOW! Easy lined or unlined ski hat pattern with matching mittens. 4 ply yarn used, on Punch card Bulky or could be made on any machine using various methods. Hats are very simple. Each hat is based in design on an animal or other cute childs love. 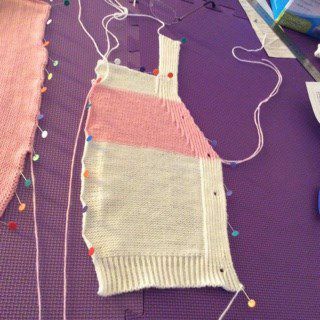 Patterns were designed using a SK155 chunky knitting machine but any machine can be used. 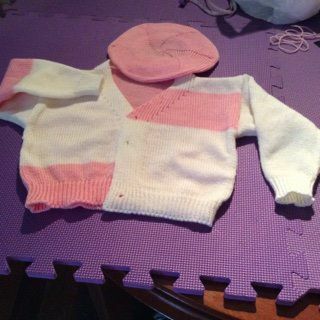 Finally, Super simple cardigans with ATTACHED bands and EASY buttonholes. V-Shaped dropped shoulder cardigans in children sizes 2-14 and adult sizes Small Medium & Large. Everyone said that this could not be done, but WE DID IT! 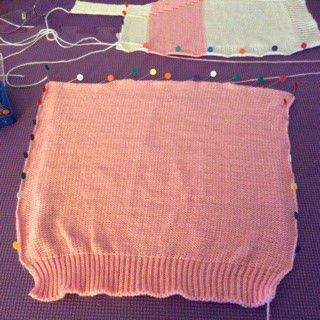 (The rib band and plain knit body are knitted at the SAME TIME, no sewing on a separate band) Introducing the "Knitting Bug Band & Buttonholes" Finally, Super simple cardigans with ATTACHED bands and EASY buttonholes. V-Shaped dropped shoulder cardigans in children sizes 2-14 and adult sizes Small Medium & Large. The 1x1 rib front band and plain knit body give a very professional look. Easy instructions. Samples were knitted in Softball or Mayflower Cotton but we give other yarns that will work to gauge. Child sizes 2, 4, 6, 8, 10, 14. Doily Collection patterns for knitting machines The first of its kind! A book of complete instructions and graphs for the knit leader or contour to create beautiful doilies or ROUND knits. ROUND SPOKE EFFECT in 4 inch; 12 inch; 14 inch; 16 inch; 18 inch; 20 inch diameters. SQUARE EFFECT in 4 x 4 inches; 12 x 12 inches; 14 x 14 inches; 16 x 16 inches; 18 x 18 inches; and 20 x 20 inches. RECTANGLE EFFECT in 12 x 20 inches; 12x 40 inches; 12 x 60 inches; 14 x 20 inches; 14 x 40 inches; 14x 60 inches; 16 x 20 inches; 16 x 40 inches; 16 x 60 inches; 18 x 20 inches; 18 x 40 inches; 18 x 60 inches; 20 x 40 inches; 20 x 60 inches; 20 x 80 inches. OVAL EFFECT in 12 x 20 inches; 12 x 40 inches; 12 x 60 inches; 14 x 20 inches; 14 x 40 inches; 14 x 60 inches; 16 x 20 inches; 16 x 40 inches; 16 x 60 inches; 18 x 20 inches; 18 x 40 inches; 18 x 60 inches; 20 x 40 inches; 20 x 60 inches; 20 x 80 inches. 80 pages of designs and instructions plus useful hints. A page of instructions for transforming doilies into hat, Wall Decor Fan, Wall Decor Mat/Wreath, and Bowls/Baskets. A special section Includes ways to create doilies using a combination of TWO DIFFERENT stitch patterns together to create more unique designs. This section includes graphs and instructions for ALL the above sizes and styles. Graphs are in half scale but are easy to convert to full scale. Standard machine with NO Ribber needed! These hoods have been designed to fit any of our standard or bulky patterns. All you have to do is OMIT any neckline band and attach this great hood for a totally different look. The hoods will fit any standard or bulky cardigan or pullover. We omitted the infants, but the size 2 hood will fit any infant pattern since an infants head is as large as a small kid. Standard And Bulky gauge machines! This simple sleeveless dress looks great over a T-shirt or Turtleneck. We have chosen to leave the edges unfinished but you could add your favorite crochet or rib trim, if desired. The bottom edge rolls but again, you could add the finish of your choice and create a totally different look. Child Sizes 2, 4, 6, 7, 8, 10, 12, 14. Sandra Dominiak sold all the copyrights to this pattern to us in 2000. 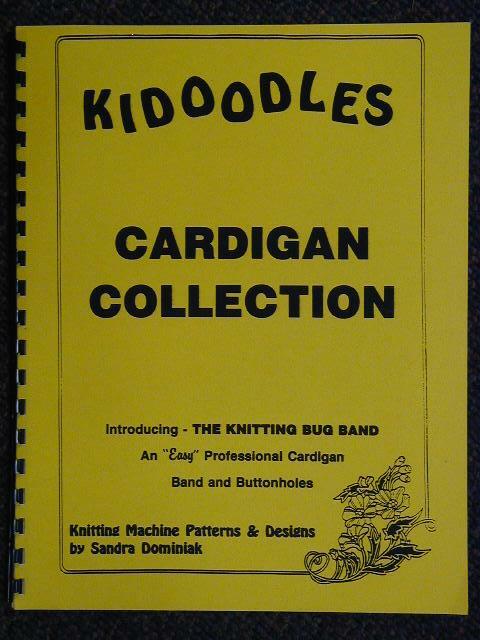 We are the sole publishers of the Kidoodles patterns and books listed on this site. Knit one of these special hair accessories for that sweet little girl to match her new knitted outfit. We have a 1x1 rib headband, a braided head band and a ruffled pony tail holder (scrunchie). Knit the ribbed band solid or in stripes. The braided headband looks great down in three colors to match your newest sweater. The scrunchie can be knit in metallic yarn, or just a touch of metallic to dress it up. 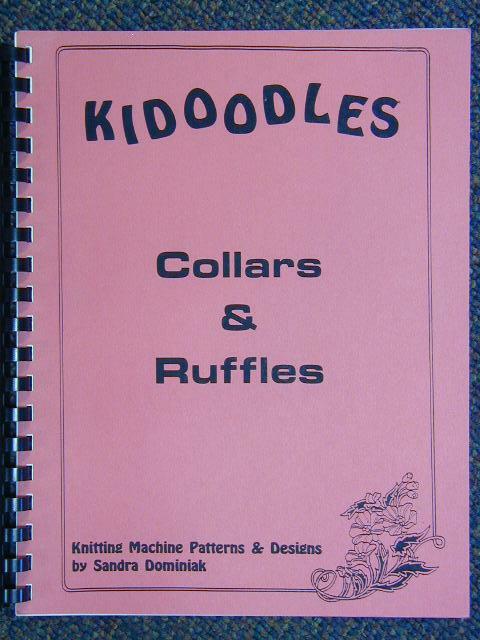 Collars and Ruffles for Knitting machines Have you ever wanted to KNIT those pretty crochet collars & ruffles onto your sweaters, jackets, tops, and shells? Now the most unique and easy method of machine knitting those CROCHET LOOK collars. There is ABSOLUTELY NO FINISHING! Just weave in the yam ends and press into shape. Crochet cotton was used for our samples but fine yarn works very well. We even tried 1 strand of 2/24 and achieved great results. 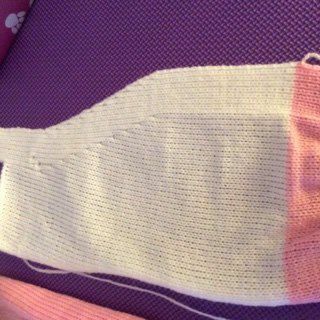 Collars are done in full needle rib so a ribber is required but they take only MINUTES to do and are easy enough for the beginner. The circular shape is achieved by pressing only. NO MANUAL SHAPING REQUIRED. 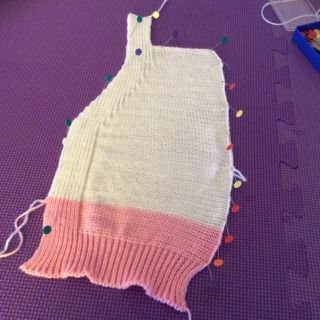 Patterns come in child or adult and are easily adjustable to various sizes. Also included are instructions for ruffles in the same styles. Knit a lacy collar and add ruffled cuffs to match on your sweater or dress. 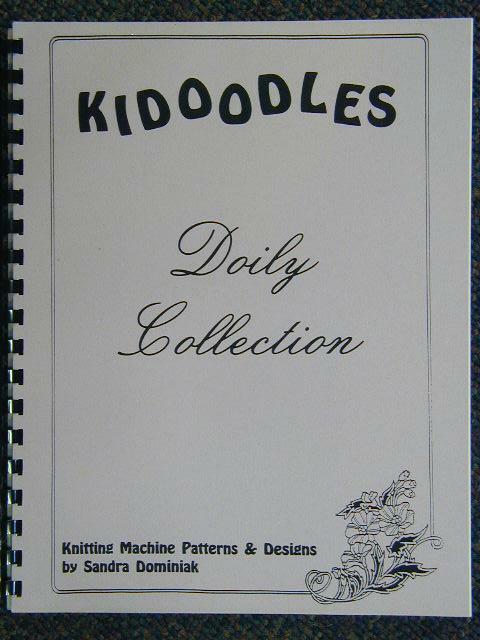 The Patch Pockets and hints can be applied to most of our Kidoodles pattern leaflets. Add pockets to any sweater, vest cardigan or pants. Placement can be anywhere you desire. Hope you also enjoy the hints included. Bulky Flap Pocket: Ribbed Top Patch Pocket, Standard And Bulky gauge machines. Vertical Ribbed Cardigan Bands with Easy Buttonholes: Knitted Fringe.